New Delhi : Union Minister for Ministry of Science & Technology, Ministry of Earth Sciences and Ministry of Environment, Forest & Climate Change, Dr. Harsh Vardhan, is leading the Indian delegation to South Africa to participate in the celebration of twenty years of Science & Technology cooperation between India and South Africa. 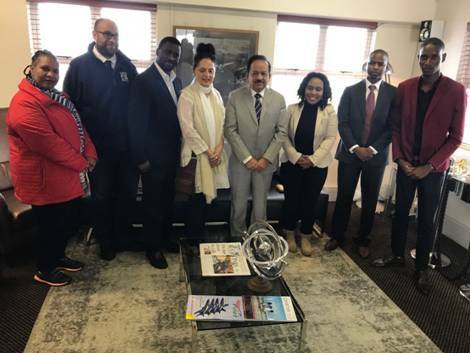 Indian delegation is visiting South Africa to strengthen the strong scientific bonds between the two countries and explore further avenues of co-operation between the two nations in areas ranging from Space Research to Bio-technology. The delegation will interact with scientists in South Africa where scientists will share experiences and insights on multiple subjects with the Ministerial delegation. The Minister made a visit to the Square Kilometer Array (SKA), which is a large multi radio telescope project under development in Australia, New Zealand, and South Africa. It utilizes radio astronomy and has receiving stations at a minimum distance of 3,000 kilometers (1,900 mi) from a concentrated central core, enabling it to provide the highest resolution images compared to other sub-disciplines of astronomy. It is being developed in the Southern Hemisphere with cores in South Africa and Australia, where there is least radio interference to observe the Milky Way Galaxy. The project will address some of the most interesting scientific questions in Astrophysics, ranging from characteristics of early Universe to search for intelligent extra-terrestrial life. The SKA is a global project with twelve member countries. India is a member state where National Centre for Radio Astrophysics, affiliated to the Department of Atomic Energy, Govt. of India is the stakeholder. 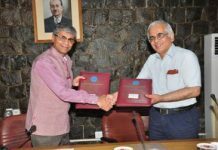 India is involved in several design work packages of SKA, notably the Central Signal Processing and Telescope Manager System, which will act as the nerve centre behind the functioning of the SKA observatory. Such technological developments are supported by bilateral research initiatives of Dept. of Science & Technology of both the nations. The SKA project will provide India astronomy community direct access to one of the best experimental radio-astronomy facility in the world. This project will accelerate technological growth of antenna, low noise electronics, analogue and digital signal processing, high-speed computing, massive data storage and mining, image processing, large software systems etc in India. Such projects present great opportunities to Indian scientific community to showcase our technological and scientific capabilities on the global stage.